Cut the salmon to create 1-in square pieces. Season with cumin, fennel seeds, coriander seeds, salt, pepper and olive oil. Season eggplant slices with salt, pepper and a few drops of olive oil. Cook on the grill, turning once until thoroughly cooked. Arrange 4 slices per plate. 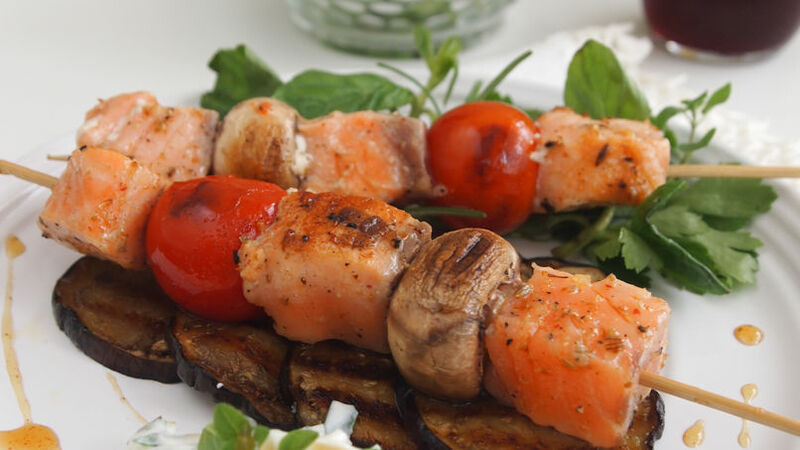 Insert the salmon pieces into 12 skewers alternating with cherry tomatoes and mushrooms. Grill for a few minutes until the salmon is cooked but still juicy. Don’t let it dry. Place 2 kabobs on each plate over the eggplants. Combine Greek yogurt and lemon juice, olive oil, mixed herbs, salt and pepper. Serve on the side. Serve with a mixed herb salad. Use any other kind of fish instead of salmon. Serve with a side of salad made with tomatoes, cucumbers, red onion and olives. Use red bell pepper instead of cherry tomatoes. Mediterranean flavors are always welcome. The fresh fish, the high quality of olive oil, the freshly cut herbs, eggplants, cucumbers, olives, among others. Doesn't the thought of these ingredients make you feel like you’re in Greece? A light marinade made with a few spices and a good olive oil is all you need to add flavor to the salmon. Cook the fish for just a few minutes so it can come out juicy and tender, not overcooked and dry. And for the side dish, a fresh salad made with vegetables and herbs goes perfect but if you prefer something heartier, you can make couscous or orzo pasta with lots of veggies. A Greek yogurt sauce goes very well with these kabobs but you can use another one of your preference.